Couch #18 belongs to Melony. She never wanted it and it wasn’t her idea. Her son Jack’s bedroom was a den for years until recently. They had cool old vintage couches and 60’s sectionals in there. But they had always wanted it to also be a guest bedroom. 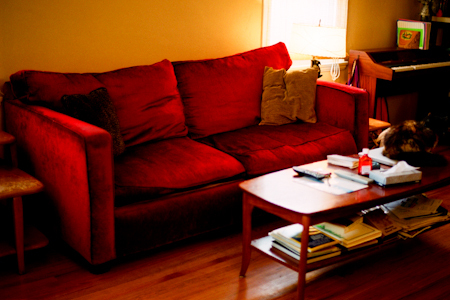 Her sort-of ex-husband Dan knew somebody who had a couch made and it worked out really well. So it seemed that they could also have couch and chair made to their specifications, and it would be a couch bed. Melony saw the design and thought that the arms were too tall and perhaps it was oversized. When they finally got it, she pulled off all of the cushions and found that it was not a fold out couch bed. So it never was actually right. Then, the couch that was in the living room needed to be recovered and has never made it back in the living room. So this couch was moved into the living room. It is comfortable, but it could be longer. Melony lives in Burbank, California, which is a city in the County of Los Angeles, in the San Fernando Valley. She lives in a house that she has owned since 1997. Melony is both married and has a boyfriend and they are not the same people. She has a son, Jack, who is 11, and a daughter, Ginger, who is 8. Melony also has a tortoise shell cat, Chopper, who is 15 or 16 years old. She had another cat, named Pumpkin, who got squashed. Get it? Although she is married, Melony kept her maiden name of Kay as well as her married name. If something were to happen to her parents, she wanted to still technically have their last name. It is also her daughter’s middle name as well as her aunt’s middle name, and her cousin’s first name. Melony works at a talent agency. She is an assistant agent in the commercial division. Melony does like to eat. She also likes to go see bands and she does like movies. While she enjoys reading, she hasn’t done much lately. Traveling would be awesome if Melony had the time and the money. Mostly, however, she likes spending time with family and friends. Melony is in a ton of pictures and hams it up in pictures. She seems very outgoing. So it is surprising to hear that she is very self-conscious when in front of the camera. She actually gets stage fright on the rare occasion that she is on stage. In fact, she gets so afraid that her voice gets all squeaky and nothing comes out. We know each other through our mutual friend Rachael. We met dancing at one of Rachael’s going away parties at Bar 107 and only one other time since. It was the first going away party of Rachael’s that she had been to. That was in March 2009. Our paths may have crossed before, but that’s the first time that she remembers meeting me. Melony thought that this project would be interesting, especially for her kids, and that when this becomes a book she thinks that they will be excited to know that they were a part of it.